Dimensions: 36 1/2 x 31 7/8 in. Location: Originally located at the entrance to Ida Waldran Auditorium, Main Hall. Currently located in McCastlain Hall, foyer. About the Sitter: Ida Waldran (c.1873-1937) joined the faculty of the Arkansas State Teachers College (now UCA) in 1908 as one of the original employees. 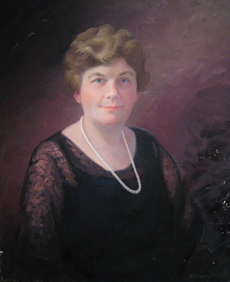 She was a member of the English department and in 1913, became the Dean of Women Students. She retired to Florida in 1934, and passed away in 1937. After her death, President McAlister named the new auditorium in Main Hall the Ida Waldran Memorial Chapel, later renamed the Ida Waldran Auditorium. In 1908, school president John J. Doyne appointed Ida Waldran and W.O. Wilson, a mathematics professor and coach, to select some school colors. During a meeting to discuss possible choices, the pair began with the clothes they were wearing. Mr. Wilson had on a gray sweater which was deemed a modest color, and Ms. Waldran was wearing a purple scarf thought to be a dignified color. The colors of gray and purple were quickly adopted and still in use today. About the Artist: Adrian Louis Brewer was born on October 2, 1891 in St. Paul, Minnesota. His father was Nicholas Richard Brewer, a well known artist throughout the United States. Adrian Brewer attended art classes at the University of Minnesota, the Art Institute of St. Paul and the Art Students’ League in New York City. He taught at the Art Institutes of St. Paul and Minneapolis, despite not having earned a degree. During World War I, he enlisted in the 444th Aero Construction Squadron, where he was assigned to work on posters, cartoons and other advertising to promote patriotism. After he was discharged from the military in 1920, he became his father’s manager and traveled around the South and Midwest. In 1933, he opened the Adrian Brewer School of Art in Little Rock, with fellow artist Powell Scott. During World War II, Brewer organized art classes at the USO in Little Rock for servicemen. In 1953, Brewer and his son Edwin established the Arkansas Art League. He passed away on June 23, 1956. Brewer is best known for his landscapes of Arkansas and the Southwest, plus numerous portraits.